Over the past five years, Oklahoma has spent nearly $2.2 million on mandatory drug testing for people applying for federal Temporary Assistance to Needy Families funds, commonly known as the federal welfare program. The results of that testing — 557 individuals between 2012 and 2016 tested positive for drug use, or about 2.8 percent of the 19,878 adult applicants who underwent screening during that time, according to data from the Oklahoma Department of Human Services. In 2012, Oklahoma passed a law requiring all adults who applied for TANF to undergo mandatory drug screening, and that those who tested positive were to be denied benefits for up to one year. Supporters of the measure at the time described it as a cost-saving measure that only codified practices the Department of Human Services were already doing to screen TANF applicants for drug use. The only difference would be that those who tested positive would not be able to receive benefits for up to one year, or six months if they sought treatment. TANF is a temporary cash assistance program paid for by the federal government for needy families, though states have flexibility with how they spend large portions of TANF funds. For example, Oklahoma’s now-shuttered Marriage Initiative program was paid for largely with TANF funds. Participation in the cash-assistance program is limited to five years of one’s adult life, and in Oklahoma the maximum a household with one adult and two children can receive is $292 per month. In Oklahoma, adult applicants for TANF must undergo a Substance Abuse Subtle Screening Inventory (SASSI), which is a self-report psychological screening assessment used to determine an individual’s likelihood of drug abuse. Individuals who show a high likelihood of drug use or who admit to drug use must then undergo an Addiction Severity Index (ASI) by a licensed drug and alcohol counselor and a urine analysis test before they can be approved for benefits. On average, each SASSI costs around $25, each ASI costs around $122 and each urine test costs around $19, according to the Oklahoma Department of Human Services. Those who test positive are referred to treatment programs, said Debra Martin, spokeswoman for the Oklahoma Department of Human Services. The bill for applicant drug testing costs is paid for with TANF funds through the Oklahoma Department of Human Services, which is the state administrator of the program, Martin said. In July, the Department of Human Services began contracting with Carl Albert State College to administer the SASSI in an effort to save money, Martin said. The new contract will lower the cost of each SASSI to around $5.50 each, and is expected to lower the number of costs of Addiction Severity Index assessments given, she said. The original bill requiring drug testing TANF applicants, House Bill 2388, was based on a Florida law requiring all adult TANF applicants to undergo a urine drug screening prior to approval. But after the Oklahoma House passed in March 2012, it was heavily amended by the state Senate, thanks in part to a federal court striking down the Florida blanket drug testing law on Fourth Amendment grounds. The Oklahoma Senate’s version of the bill put into law the Department of Human Services’ existing practices of using the Substance Abuse Subtle Screening Inventory to screen individuals applying for TANF for drug use, and then if the applicant showed signs of drug use, follow up with an Addiction Severity Index and urine drug test, said Sen. David Holt, R-Oklahoma City, author of the Senate version of the bill. The only effect of the bill, Holt said, was that individuals who tested positive would not be allowed to access TANF benefits for a year, unless they sought treatment, in which case they would not be allowed to access TANF benefits for six months. “We basically chucked that bill (passed by the House) and I worked with DHS and asked ‘what do you currently do?’” Holt said. That measure overwhelmingly passed the Senate with bipartisan support and was signed into law by Gov. Mary Fallin. Its provisions went into effect Nov. 1, 2012. Because the bill only put existing Department of Human Services practices into law, Holt said, the bill would have had little effect on the cost associated with testing TANF applicants. 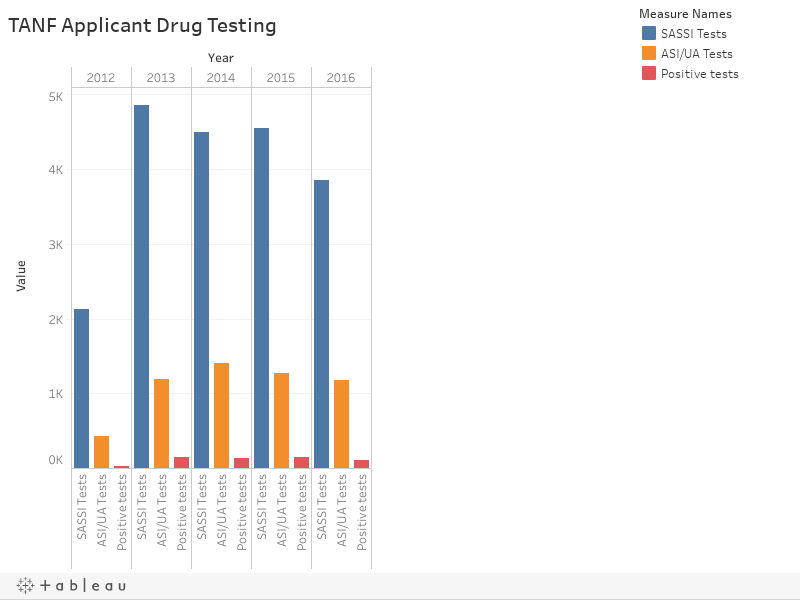 However, data shows the Department of Human Services significantly increased the number of drug tests it gave TANF applicants the year after the law went into effect — despite having fewer applicants to test. Data provided by the Department of Human Services shows that in 2013 the number of SASSI tests given to TANF applicants more than doubled from 2012, and the number of Addiction Severity Index and urine analysis tests nearly tripled, despite the total number of TANF applicants falling by more than 15 percent during that time. Martin said the Department of Human Services only did SASSI screenings prior to 2012, and did not do urine analysis screening or Addiction Severity Index assessments. The drop in the number of individuals who applied for TANF benefits may also be in part attributable to the drug testing requirements, Martin said. The goal of the bill, Holt said, was to encourage those who test positive to get off illegal drugs to make the best use of the temporary program. Whether it has accomplished that goal is unclear, Holt said. “I hope it’s made a positive difference in the lives of those few hundred people we’re talking about (who tested positive) and given them positive encouragement to get off drugs and come back,” Holt said. The data from the Oklahoma Department of Human services also shows the amount billed to Medicaid for drug treatment by TANF applicants who tested positive for drug use. According to that data, the amount billed to Medicaid for drug treatment spiked in the year after the TANF legislation was passed. However, after 2013 the amount billed to Medicaid for drug treatment has fallen significantly each year, the data shows. In 2016, the amount billed to Medicaid for treatment was only $1,756 more than in 2012, despite 2016 having double the number of positive drugs tests as compared to 2012. Though it is hard to say what the exact causes of the decline in amount billed per-positive test, it’s likely safe to assume that a lower percentage of TANF applicants who have tested positive for illegal drugs are seeking treatment, said Department of Human Services spokeswoman Debra Martin said. In total, $1.2 million has been billed to Medicaid since 2012 for drug treatment for TANF applicants who tested positive, the data shows.